Just finished up 4 days in a row, and the Back Bay of Biloxi gave up some pretty good catches for TEAM BRODIE CHARTERS crew. My first day back on the water after vacation with the Moss family from Pontotoc, MS delivered 74 fat white trout, 18 black drum, 4 specks, and 3 legal redfish that we released. The next two trips delivered white trout and black drum, and we were lucky to get a few hours on the water to catch them with all of the rain and lighting. On Monday I had return client Jim Swittenburg back aboard for the second day in a row, and Jim and his son Johnny had a ball catching redfish and black drum in the rain. 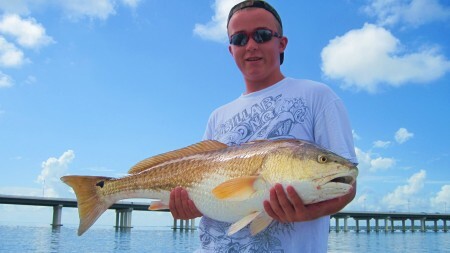 Johnny had the catch of the day with a huge bull redfish. All of the fish were released including 2 flounder and a few specks and white trout. Great people and great fun! Hopefully all of our waters will be opened back up any day now for catch and keep, so let's keep our fingers crossed. Still fishing consistently and catching fish, so some on down and let's fish. Remember, the barrier islands are now open for catch and release (Florida pompano, bull reds,etc.) and it would be fun just to check things out first hand. Just got back from vacation and daughters wedding in Chicago. Had a great time! Caught a Cubs game at Wrigley Field, did the city, including restaurants & parks, Navy Pier, and the architectural boat ride of the cities magnificent high rise buildings. Had Illinois Congressman Mike Quigley preform the ceremony, and Mike did a beautiful job. Mike and his wife were most gracious, and opened up their home to all of us. It was a much needed get away, but now it's time to get back to business, and that's catching fish in south Mississippi aboard TEAM BRODIE CHARTERS. Starting Friday I have 4 days in a row, and looking forward to doing what I do best, and that's catching fish in my big back yard including the Back Bay of Biloxi and the Mississippi Sound. By the way, although it's catch and release the Mississippi Sound is back open to fishing, and that will give us a chance to see what the fish population looks like farther out of the bays. Hopefully soon we'll be able to keep the fish caught farther out in the Mississippi Sound and around the islands. So come on down folks and let's get back to fishing, having fun, and enjoying all that south Mississippi has to offer. Hey, I've remained positive through all of this mess and continued to run successful charters, and will continue to do so. So put this man to work and book your next fishing trip aboard TEAM BRODIE CHARTERS right now. 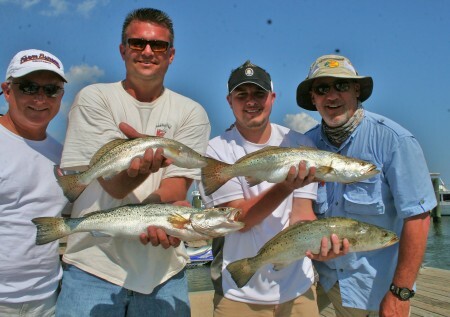 Have plenty of openings for August, an excellent time to fish in south Mississippi. 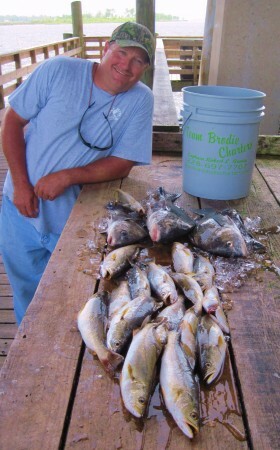 Simply give me a call at (228) 697-7707 or shoot me an e-mail at captainbrodie@teambrodiecharters.com and let's fish! Picked up a last minute trip for today, and have to admit the fishing was very slow compared to the last two weeks of fishing. However, Leonard Jarrett from Alabama had a ball catching a mess of white trout, as well as a few hard-pulling black drum. 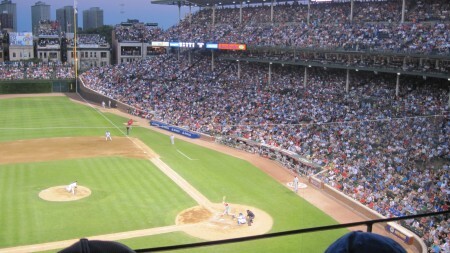 Taking a few days off heading to Chicago to see the sights and catch a ball game at Wrigley Field. Been running practically every day for the last month in a half, and a bit of time off will be much appreciated. However, I do truly appreciate all of my clients hanging in there with me through this oil crisis, and let's keep it going despite one of the largest oil spills known to man. Can't quit now, have to much invested In TEAM BRODIE CHARTERS. Yesterday had Kenny and Charlotte Bryant, Ruby Anthony, and Josiah Holliman aboard TEAM BRODIE CHARTERS, and this fun group put the hammer on the bay dwellers. Live menhaden fished on the bottom put 107 white trout (many were of the big "yellow-mouth" variety"), 3 big speckled trout, and 2 fine flounders in the box. Left the white trout biting on 2 occasions, and these were some better than average fish coming out of the bay's deeper waters. So far I am still limited to fishing in the Back Bay of Biloxi north of the train bridge, but nice catches are still being brought to the dock. At this point in time I have the 20, 21, 22, 27, 28, 29, and 30 of July open. Book a trip now for they are filling up fast this month. However, have plenty of days open in August, including most weekends. What can I say...we're still catching plenty of fish and having a great time aboard TEAM BRODIE CHARTERS. 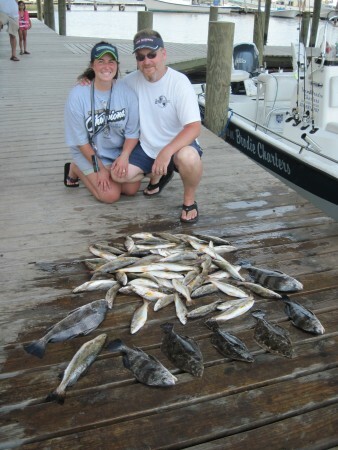 Today I had John and Jodi Nabors fishing aboard TEAM BRODIE CHARTERS, and their morning trip was quite successful. Well, this duo hammered the white trout using live menhaden while vertical fishing right under the boat. It's a fact, Jodi had the hot hand today, and managed to catch the vast majority of the fish. By the way, the Back Bay of Biloxi is simply full of menhaden, and one throw of the brill net usually fills both live wells with the lively minnows. On that first stop they easily boxed over 70 fine white trout, but we had one more stop to make. 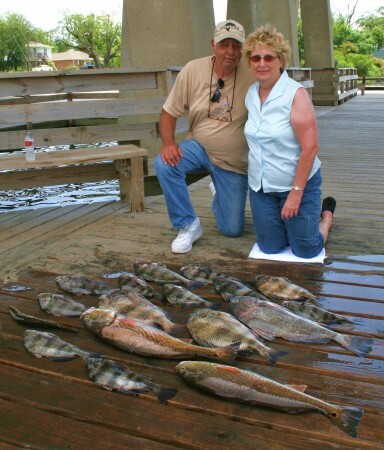 At the railroad bridge the fish catching couple added 3 fine flounders, 4 black drum, as well as a fine speckled trout to their morning catch. 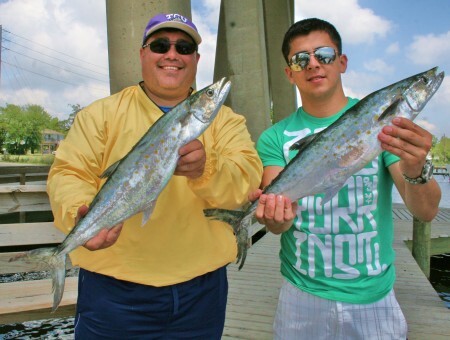 In all, another fun day of bay fishing aboard TEAM BRODIE CHARTERS with a splendid pair of anglers. The water in the bay is clearing up nicely after all the rain, and when the winds die down it's surface becomes covered in nervous menhaden, Truly a beautiful sight! So give me a call and let's creat some fish catching memories of your own! YES, MOST OF THESE FISH WERE CAUGHT FISHING IN THE RAIN! HAD SOME HARD-CORE ANGLERS, BUT IT WAS FUN! Well folks I am still hanging in there and catching plenty of fish despite being confined to the Back Bay of Biloxi. Just give me some water and we'll put fish in the boat. Fished last Thurday with return clients Jim Underwood and his wife Brenda from Alabama, and caught a big redfish, some nice drum, and a few white trout. Released all of the big fish alive at the dock aftert pics, and he was just looking for a pull anyway. Monday had the Don Ludke group and they caught a few drum and white trout. Had Ted Dragoo and family on Monday, and they had a ball catching a couple of big drum and a mess of white trout. On Tuesday the Nelson group had a ball catching 58 nice white trout in the rain, as well as a black drum. Have the next 4 days booked in a row, and will be working the white trout holes throughout the bay. We are only allowed to fish on the north side of the railroad bridge, and if they would let me fish the other two bridges at the mouth of the bay I could produce more drum and redfish for my clients. Anyway, I will be taking some time off during the middle of the month, but if the waters continue to stay open look me up the last two weeks of the month. Still hanging in there! TEAM BRODIE CHARTERS won't give up on you, so don't give up on me! I here for the duration baby! Since I got forced back into the bay, inside the railroad bridge, well, it was back to some old fishing holes that I generally fish during late summer and in the fall, but they paid off yesterday. My clients were the Cummins Gary group, more come back clients, and Cummings and the 3 teenage boys simply hammered the hungry white trout. Today we were fishing the deeper waters of an old channel, and live menhaden dropped down under the boat never had a chance. It started off slow, but after a while it was a fish on every drop. The teenagers fished well, were self sufficient, and I have to admit I did not realize how many fish they boxed off the front of the boat. But you know, every angler needs to experience a good old white trout slaying once in a while. They had great fun, and went home to South Carolina with 400 scalled, filleted, and deboned fillets. 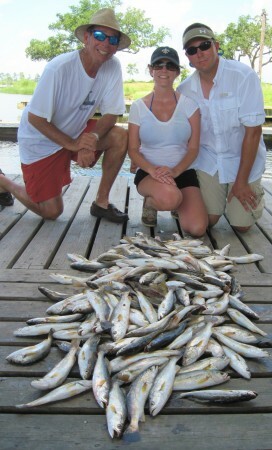 Looks like another big fish fry coming up courtesy of TEAM BRODIE CHARTERS. In the last 4 trips my clients have caught over 500 edible fish, not bad considering we're trying to keep things going strong in the middle of an oil crisis in limited fishing waters. My friends I'll continue to fish as long as I can, so don't give up on me for TEAM BRODIE CHARTERS is in for the duration. As long as they allow me some waters to fish you can bet we'll be there wetting a line. Keep the faith my friends for WE WILL overcome this situatiuon! BAD NEWS! OK, first of all I am book solid throught July 5, but the fishing now has to be conducted west of the I110 Bridge, and that may change too at the drop of a hat. I've been patient and optomistic up to now, but it looks like we are are going to get a dose of the black stuff now. If I have to fish up in the bay and rivers I'll do so. Maybe not as many fish at this time, but some real gorgeous scenery never the less. GOOD NEWS! The last three days have been phenominal for the white trout bite, but I got ran off the reef by a Vessel of Opportunity boat today just outside the Oeann Springs Bridge. How good has the bite been? Well, today my group (Mike Bertucci, his daughter Olivia Garris, and her husband Kevin Garris) boxed 170 fish by 10:30, and they were biting like made when we left. Caught them on live and dead shrimp and menhaden fished under popping corks, as well as jigs, a bare treble hook (I swear), pieces of white hand rags, and pieces of soft plastics baits impaled on treble hooks. On Saturday my clients Max Gilpen and his 3 sons boxed 60 and left them biting, and on Friday Ronald Tubbs, his wife Dawn, their daughter Mary and son Landon a.k.a. "LT" hammered them too. Bottom line, the fishing grounds are on fire, but now they are off limits. 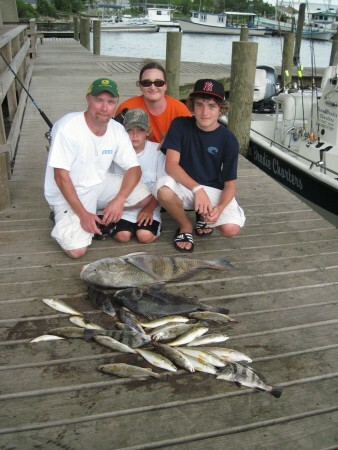 This family group easily boxed 100 white trout, a nice speckled trout, and a black drum. Oh well, I'll continue to fish where allowed, and will dabble in some river fishing. By the way, the Tchoutacabouffa River and Biloxi River are simply gorgeous waterways, and make for an enjoyable day on the water. Heck, we may have to go to crickets and worms, but it's still quite fun. Well I am out of here for now, and will report back later with more news...hopefully something good. THANK GOD...STILL NO OIL ON MY FISHING GROUNDS & THE FISH ARE BITING! Was back at it on Sunday and Monday, and well, it was more excellent Mississippi Sound & Back Bay of Biloxi light tackle fishing action aboard TEAM BRODIE CHARTERS. On Sunday it was return clients Jay Samander and his son Josh, and man did they ever catch fish. Our run to the white trout reef delivered 70 fine fish, and a run back into the bay produced 2 black drum, a fine redfish, and 3 nice speckled trout. Jay is an extremely easy going guy to fish with, and it's a yearly tradition to bring his sons fishing with Capt. Brodie. And that my friends is what TEAM BRODIE CHARTERS is all about. Bottom line, a very fun half-a-day outing! On Monday I had a last minute afternoon trip...three guys from Miami. The storms chased us in from the white trout reefs, but right smack into hordes of hungry redfish in the bay. They quickly caught their 9 fish, and after that the bigger fish started to bite, but they had to release those beauties. Great fun never the less! They added 3 nice specks and 2 big flounders to their catch too. What can I say, no oil, and the fish are biting! Just finished up two days of fun bay fishing on Friday and Saturday, and a mixture of redfish, speckled trout, big white trout, flounder, and black drum kept the rods bent. Friday it was come back client Steve Prince and his girl friend Cindy, and they took home a fine box of inshore fish. 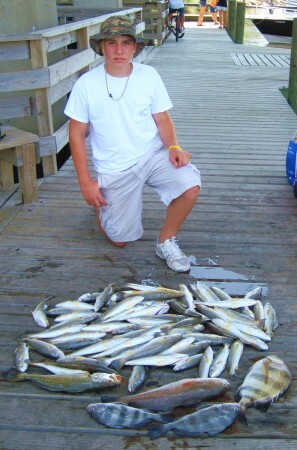 Included in the catch was 3 fine redfish, 6 black drum, 3 speckled trout, and 50 big fat white trout. Live shrimp and menhaden fished under popping corks fooled all of the trout (whites and specks), and Steve and Cindy wore out around the 50 mark. That was some of the biggest white trout of the season so far, really nice fish! It was a nice half-a-day outing, and as usual Steve was a great sport and fun to fish with. Saturday was a nice half-a-day trip too. Charlie Schudmak and his buddy Bob would pass on hammering the white trout today, but their efforts paid of with 4 beautiful redfish (released 2 more just under the size limit), 9 black drum, a nice flounder, and a couple of bycatch white trout. The Back Bay of Biloxi is full of menhaden and mullet, and the water looks nice at the mouth of the bay. It was two gorgeous calm mornings to fish, and we beat the heat by getting in early each outing. Will be back out tomorrow (Sunday) and will report back soon. Bottom line, been beating the heat with early morning outings, and coming back to the D'Iberville Marina with some nice mixed bags. Excellent light tackle fishing fun! Photography Portfolio: Go to flickr.com and type teambrodiecharters in the search box or click on the pictures on my web site, and there you'll find nearly 2000 of my fishing and duck hunting pictures. Enjoy! Inshore Bite Remains Strong Aboard TEAM BRODIE CHARTERS! Fished Friday with comeback clients Steve Story and Ron Pederson, and the two gentlemen managed to keep the rods bent all morning long. When the dust cleared the men put 38 black drum in the box, as well as a legal redfish. Could have hammered the white trout, but opted to pass on them since we had plenty of fish for the fish fry. Then on Saturday my clients were James "JT" Rowell and his 10-year-old-son Zack who by the way is an excellent angler. This father and son duo were on the fish today, and managed to easily put 50 white trout, 14 black drum, as well as a nice flounder and redfish in the box. Bottom line, two beautiful days of fishing with extremely enjoyable guests hauling in the fish, and it just doesn't get any better than that. So come on down to south Mississippi and catch your share of fish aboard TEAM BRODIE CHARTERS. It's your adventure just waiting to happen! 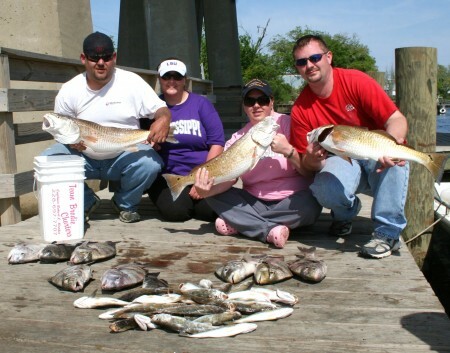 BACK BAY OF BILOXI DELIVERS REDFISH, BLACK DRUM, FLOUNDER, SPECKS, SHEEPSHEAD, & WHITE TROUT THIS WEEK! OK all of you fishing finatics, I just finished up 5 days in a row of mostly bay fishing with wonderful family groups, and they caught a variety of fish merely minutes from the D'Iberville Marina. Oh yeah,these old bones are tired, but with a day or two of good rest I'll be ready to get back after the fish again. Hey, the fish need a rest too! Ran Thursday through Monday, and most fish were caught under bridges and over concrete rubble using popping corks in shallow water, and vertical fishing in deeper water. By the way, the bay is simply full of menhaden, and they will fatten up the bay dwellers quickly. In the deep water, a big dead shrimp has drawn most of the bites, and in the shallows under a popping cork live shrimp have been the ticket to success. Since there are to many trips to report here be sure to go to my web site www.teambrodiecharters.com to get the full details and pictures of the fish caught. And while I am at it, a potential client from Jackson, MS just cancelled a trip for Saturday saying he heard oil was in our waters, and our waters were closed. Couldn't convince him other wise! Folks, I have yet to cancel a trip due to oil, and our waters have been free and clear of oil and still are. Now I am sure I've lost a lot of trips from the threat and people not calling, but to date no oil in these waters and I've been running and catching fish consistently. If not for the oil threat I would be probably running every day! OK, with that out of the way fishing remains very good in south Mississippi, and the weather seems to be getting right too. Had to fish in fowl weather conditions for most of those trips, but we put fish on the dock anyway. 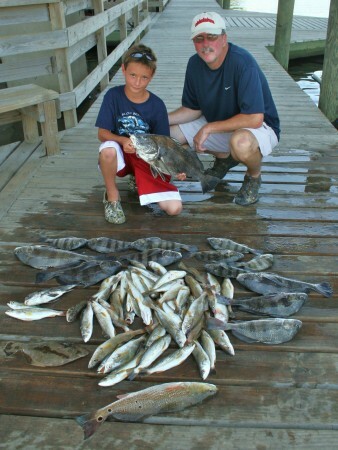 You name it, a variety of fish including: redfish, speckled trout, black drum, sheepshead, flounder, ladyfish, gafftopsail catfish, and white trout have been providing plenty of light tackle action. 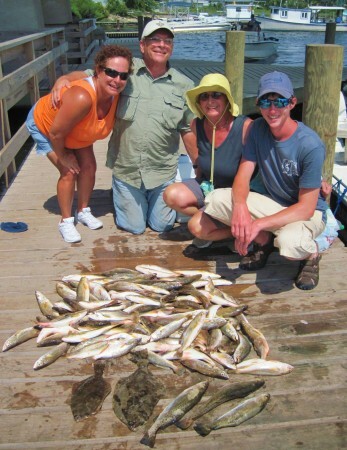 So gather up the friends and family and come on down to south Mississippi for some light tackle fishing fun aboard TEAM BRODIE CHARTERS. We're open for business, and always have been! PS: Haven't been to the islands lately due to poor weather conditions, but looking forward to getting back out there soon to find Spanish mackerel, bull redfish, Florida pompano, and big specks, may be on Friday if weather permits. Photography Portfolio: Go to flickr.com and type teambrodiecharters in the search box, and there you'll find over 1,500 of my fishing and duck hunting pictures. Enjoy! Would have ran Saturday, but on the way to the white trout reefs the lower unit went out. Thank God for good friends because Capt. Brian Cuevas ran out and towed us in, and by noon Philip Bond of Crown Leisure Marine had a new lower unit and stainless prop back aboard TEAM BRODIE CHARTERS. One thing for sure, "Good friends are good as money in the bank", and Brian and Philip sure turned my lemon day into lemonaide. I know I am always picking on Brian about something and bugging Philip down at the shop, but man did they come through in a clutch. Many many thanks my friends! Back at it on Sunday for a short morning trip with come back clients Jim and Pam Gathright from Texas, and with a strong rising tide the bay bite was on around the bridge structure. The couple fished hard, missed a lot of fish, but ended up with a nice mixed bag of redfish, black drum, sheepshead, a speck, and white trout. Would have made a run to the barrier islands, but nasty thunderstorms were lingering in the Mississippi Sound. It was a good call to stay in close and scratch up a box of fish. Lost a couple of really big fish including a huge bull red at boat side, but ended up with 2 gorgeous redfish, a nice speck, 10 or so black drum, 3 big sheepshead, and a couple of white trout. Released numerous reds just under the slot and a few specks too. Got them coming back again in September, and hopefull this oil spill mess will be shut off. Let's hope and pray! However, up to now we've dodged the bullet, and the fish have been biting well out of Biloxi. To date I am booked June 3, 4, 5, and 6, but have plenty of openings the following week. So come on down to south Mississippi and let's catch a mess of fish and have some fun doing so. Remember...TEAM BRODIE CHARTERS offers a "5-hour" half-a-day trip for merely $350, and that includes up to 4 anglers, ice, bait, tackle, rods & reels, fuel, Mississippi fishing license, fish cleaning and packaging, as well as a big dose of southern hospitality. Or go for the "8-hour" all-day for $450 if you need more time to get away from the hustle and bustle of life. It's all good...let's fish! 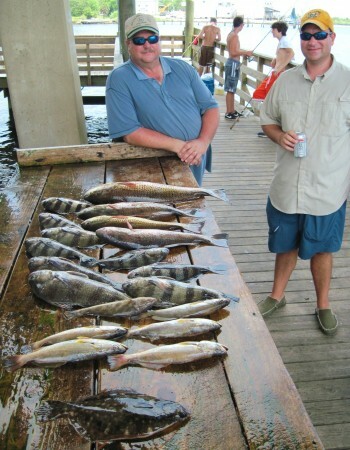 PS: Caught all of the fish pictured below merely 5-minutes from the D'Iberville Marina. Been real busy as of late, and the fishing has been quite good. The white trout reefs are on fire, and the big specks are prowling the barrier islands and wrecks. Florida pompano are starting to show in better numbers, and Spanish mackerel, bluefish, and ladyfish have been swarming around the barrier islands in huge schools. Got that fly rod handy? 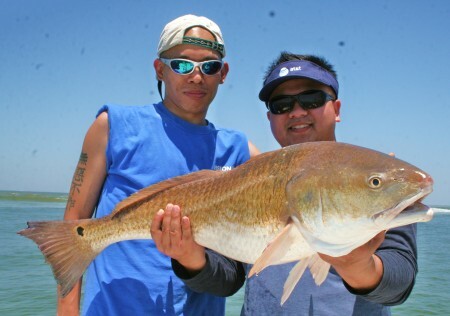 Bull redfish have been prowling around the barrier islands too, and flounders are stacking up on the front beaches also. Bottom line, no oil in Biloxi, and the fishing is going strong. Hey, as long as the oil stays away the fishing is only going to get better, so hop aboard TEAM BRODIE CHARTERS, and create some fishing memories of your own. Yes...I know it has been a while since I've last reported, but its been a good thing for I have quite been busy running plenty of trips. And with all of that mess in the gulf it hasn't slowed things down a bit for me to date. Catching a bit of everything from a few bull reds, bluefish, and Spanish mackerel at the barrier islands, to flounders, white trout, redfish, flounders, ground mullet, and black drum in the bays. And yes...FLORIDA POMPANO ARE IN! Saw them in good numbers in the shallows 2 days ago on a recon trip, and it was a mixture of small to big fish. Now all we need is some nice calm weather, and anglers willing to go after them. Any takers? Also, plenty of big bull sharks prowling the shallows too, and would do catch and release on them if anyone might be interested. White trout are in good numbers, and I've been catching some hefty specimens in the bay just a few minutes from the launch. Excellent light tackle fun, and they have been hammering the live menhaden. And yes, the menhaden are getting to be a decent bait size too. Be sure to go to my web site at www.teambrodiecharters.com for more pictures and details of recent trips. Bottom line, still fishing and catching fish, and nothing has changed due to the oil spill so far. So hop aboard TEAM BRODIE CHARTERS and let's fish! Saturday A Few Black Drum & Big White Trout In Inner Bay Made For Inshore Fishing Fun. Saturday it was rough...really rough...and so I decided to keep my 2 clients in the safe confines of the Back Bay of Biloxi. Fishing was tough, but decided to fish some of my late summer and fall white trout honey holes, and the idea paid off. My clients Josh Aldridge and Frank Key from Tupelo, MS fished hard to pull 26 really nice white tout out of the deep holes. The guys added a couple of puppy drum to the mix also, and they simply had a blast catching and releasing plenty of stingrays and croakers, as well as a big gafftopsail catfish. These were fun guys to fish with, and they are definately coming back when the weather straightens out. Weather looks good for the rest of the week, and I am booked for tomorrow and Wednesday, so it's off to fishing once again. Last report on the oil slick was that it had moved out a good bit, and broke up a lot. Keep the faith my friends! Oh yeah..flounders are moving in well on the front beach..come and catch a few aboard TEAM BRODIE CHARTERS now. Today I had regular clients Don Thomason and his son Brad back aboard TEAM BRODIE CHARTERS, and a run out to the barrier islands in search of sheepshead and Spanish mackerel proved to be a bad decision. Although the fishing for these two species had been good as of late, well, today they were nowhere to be found in our area, and so it was off to Plan-B. However, a run back inshore proved to be a good call, and there the guys boxed 12 fine flounders, 5 beautiful speckled trout, as well as 2 black drum. Don generally doesn't need to catch many fish to make him happy, just enough for 2 or 3 meals generally holds him until our next outing. Although once in a blue moon he has been known to sanction a big big white trout, ground mullet, black drum, or sheepshead take on rare occasions. With these gentlemen it's always a no pressure trip, and we just have a great time on the water kidding around and having fun. Both Brad and Don are very witty, like father like son, and they will keep you laughing no matter how the day is going. Ideal clients! Bottom line, another excellent day on the water aboard TEAM BRODIE CHARTERS. MORE BIG SHEEPSHEAD & BIG SPANISH HAVE ARRIVED! NOTE: At this time I have Monday through Thursday open, and the weather is looking good during that time! Tuesday is looking really good too, and would like to get someone interested in chasing those big Spanish mackerel again. Today was an excellent one at that! With calm seas it was a run out to the barrier islands and the surf was crystal clear. Better yet, the big sheepshead were milling about in the knee-deep waters, and it was a gorgeous sight. Many of these are big sows, and their faces are lit up in a bright turquoise, a really awsome sight to start out the morning of fishing. My guests were Ed Rubiera from Orlando, Florida and his son Ritchie, and they simply had a ball fighting the hard fighting sheeps in the shallows. Had to go stealthy, just a hook and a split shot, but we got them to bite and the father and son duo has a wonderful time with the powerful fish. After they put 9 hefty sheepshead in the live well it was time to go explore the miles of shallow flats. Our intentions were to find a couple of redfish, but the guys got side tracked casting to very aggressive Spanish mackerel, and the speedy fish put on a show slashing at jigs pulled behind the boat. Well, they quickly forgot about redfish, and decided to concentrate efforts on the voracious Spanish, and the guys proceeded to put 12 fine fish on ice. These fish would follow the baits right up to the boat, and over the yellow sandy bottom the fish stood out clear as a bell. These were better than average Spanish, and 2 of the fish were real logs. Folks, these are some of the fastest fish in southern waters, and on light tackle, well, their blazing runs make for exciting action. Just another beautiful day of fishing in south Mississippi with great people, calm seas, and hungry fish. Hey, it doesn't get any better than that! Have yet to jump any Florida pompano, but the water conditions are just about ideal, and I am waiting to spot my first tripletail anytime now. Patience is a virtue my friends! Oh yeah, I have plenty of openings from Sunday through Thursday, so let's go catch a mess of fish. White trout and ground mullet are on the inshore reefs, black drum are moving back into the bay, and flounders are on the front beach area too. Had just finished up 4 days in a row, and I was sleeping soundly trying to get this old body caught up on some much needed rest when the phone rang at 7 am. "Hey Capt. Brodie...where are you? ", were the awaking words on the other end of the line. It was Nick Ward, a regular client aboard TEAM BRODIE CHARTERS with his dad waiting on me down at the D'Iberville Marina. Oh yeah, a mix up in communication no doubt! Jumped up out of bed like a bolt of lighting, started grapping up the essentials, wife trying to help, threw the rods into a dirty and unorganized boat, and off I went down to the marina. Well, those that fish with me know I use the best of tackle, and keep it as well as the boat spotless and well organized. But not today folks...I was winging it! Heck...I was only about 35-minutes late, and thank the Good Lord above Nick and his father are the cool and laid back type. Better late than never, and off we went. Today it was a bit windy and decided to fish in close, after all Nick just wanted his dad (down on vacation from up north) to have an easy laid back day of fishing. 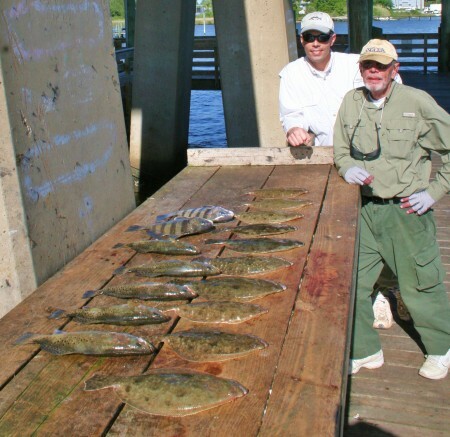 And light tackle fishing in the Back Bay of Biloxi and surrounding waters is one of the best way to have such a day. But all ended well, and Nick and father Mike ended up catching all sorts of bay dwellers. You name it, redfish, flounders, black drum, white trout, big croakers, ground mullet, and even a big spot entered the cooler. In the calm waters of the bay we simply moved from spot to spot catching fish on practically every move, and the father and son duo had a wonderful time fishing together. 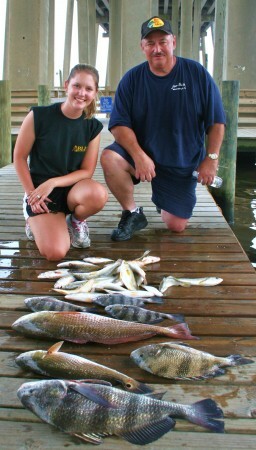 They easily filled up a 60 quart cooler to the rim, and we left the black drum biting in the afternoon. As usual Nick followed me back home where we proceeded to clean up the fish, Nick always helps, and it's a great way to end a day of fishing shooting the breeze about our fishing trip. What started out as a lemon was turned into lemonade, and I finally got to sleep in a bit today thank God. Have a few more trips lined up for the rest of the week, but right now Saturday isn't looking very good for barrier island fishing. However, we can always fish the protected waters of the bay. Still waiting on the big sow specks, Spanish mackerel, Florida pompano at the islands, and looking for my first tripletail of the new season. But it's all good, and it's only going to get better and better! Photography Portfolio: Go to flickr.com and type teambrodiecharters into the search box, or click on any of the pictures on my web site and it will take you there. Hey, this old man is beat so this will be short! Been on the water for the last 4 days straight and the bite has beed good and quite diverse. Caught a little bit of everything including redfish, black drum, sheepshead, white trout, whiting, and ground mullet. Weather has been great, and most of my people have been come back clients. Had a bang up trip on white trout and ground mullet on Friday, and the group easily put 130 fine fish in the box. Left them biting hot and heavy! 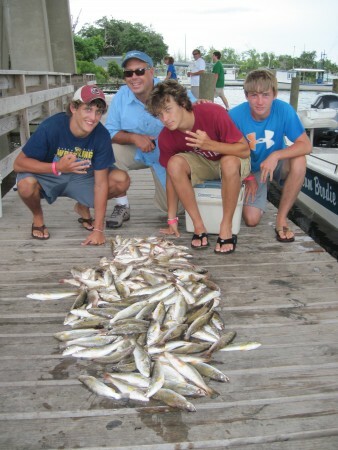 All of these fish were caught under popping corks on shallow reefs. On Saturday boxed 3 nice redfish, 7 sheepshead, 4 black drum, and 40 white trout. On this day we fished the surf in a 4 foot roller, but the group hung in there and had a blast. Extreme surf fishing! Sunday was a bit rough and the isle's water dirty, but got 2 big redfish, 20 nice whiting, and 4 black drum. 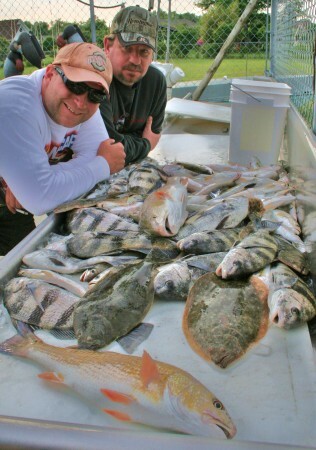 Had the same group on Monday, and the guys boxed 17 big sheepshead, as well as 4 black drum. Regular clients are always a hoot to fish with, and that always make time spent on the water extremely enjoyable. Have tomorrow off, but will be back on another long run of trips again starting Wednesday. Can't wait to sleep in late tomorrow! Still waiting on those pompano to show up in my neck of the woods, and have a list of people waiting to go catch the speedy silver-hued beauties. Can't wait for the run to get hot! 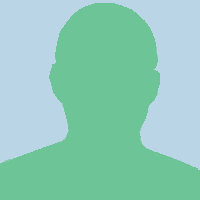 Call me at (228) 697-7707. Hey, the Back Bay of Biloxi has plenty of fish right now, and it's only going to get better. Just keep poking around that area in your little skiff and you'll find all sorts of fishing spots others are passing by. Anyway...good catch, and enjoy eating those tasty bay dwellers! Those white trout and ground mullet are the best there is! If anyone in the kayak clubs are interested in transport to fishing grounds like the barrier islands that can be arranged aboard TEAM BRODIE CHARTERS. The inside flats of the isles offer miles and miles of clear shallows covered in grass beds, shallow bars, and gullies. Excellent fishing grounds! For further information contact Capt. Robert L. Brodie at (228) 697-7707 or shoot him an e-mail at captainbrodie@teambrodiecharters.com, and be sure to check out his web site at www.teambrodiecharters.com. Prices will be like my charter trips, and I'll just hang around wade fishing or what ever while you do your thing. Capt. Robert L. Brodie of TEAM BRODIE CHARTERS has not filled this section yet.